Home Blogs Do tradespeople need a website? If you’ve got a website, you can direct people to it when they want to know more about you. This is great if you don’t carry business cards but even better if they want to know all of the things you offer. Your website can include all of your services in a clear and concise way so that people can see if you offer what they need and get in touch with you. You can also use a website to show examples of your work, such as before and after pictures, and feature reviews and feedback from previous customers. Whether someone searches for a tradesperson in your area or they see one of your vans on the road and search for your business name online, having a website that appears when they make those searches will improve your visibility to potential customers. As most people today ‘google’ what they are looking for, a website is the best way to publicise your contact details online so that people can get in touch and inquire about your services. A website can create a professional impression and some customers will feel more comfortable using a tradesperson that has a public profile rather than a tradesperson that is not very well known. Tradespeople should use their website to demonstrate their expertise by adding content related to their profession. ‘How to’ blogs and ‘before and after’ images are a great way to the customer to consider you as the authority in your industry. This is likely to make potential customers trust you to carry out a job for them. If your friends, family or a previous customer has recommended you to someone else, they’ll naturally want to go online and check out the services you offer and find out more about you before getting in touch. Even though you have already been recommended to them, a website can be the difference between them getting in touch with you, or not. Without a website, you may miss out on potential customers. If you’re using social media to promote your services you should really have a website to increase the effectiveness of your efforts on platforms like Twitter and Facebook. If someone comes across you on social media, it’s quicker for them to click a link to your website and find out more about you there-and-then rather than remember to get in touch with you in the future. If you want to be a bit more advanced with your marketing, you could run your own adverts on google (also known as Adwords), and pay to appear in Google searches when people search for the services you have to offer. This type of advertising is powerful in localised areas and requires a website. If the benefits we’ve mentioned above have convinced you that it is time to get a website for your business, you might now be wondering, ‘how?’. The good news is that a website doesn’t have to cost the earth, in fact, it can cost as little as the price of the domain and the hosting if you’re willing to put it together yourself. It’s important for your website to look good so that viewers take you seriously, however, you don’t need to go over the top with irrelevant features and pages. The key is to keep it simple and ensure that customers understand what you do and make it easy for them to contact you. 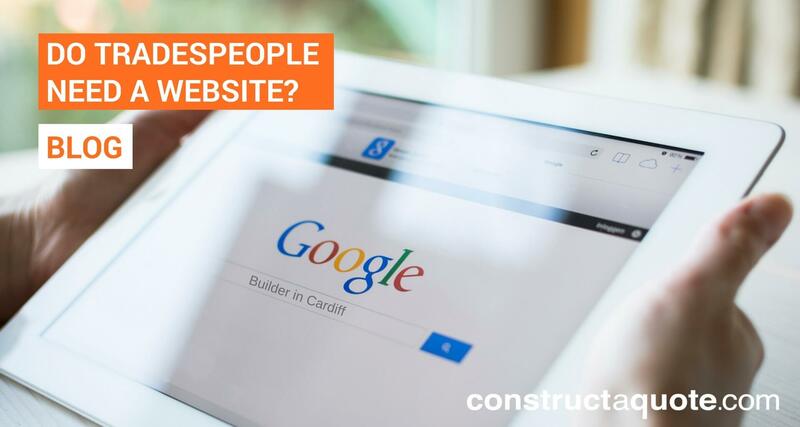 As tradespeople are commonly very busy, chances are you won’t have time to build a site yourself. Luckily, companies like SunZu can take the hassle off you by creating a tradespersons website for as little as £227 in just a few days. What to win more customers? Check out these 4 Marketing Ideas For Tradespeople To Get Noticed.